You a coffee fan? 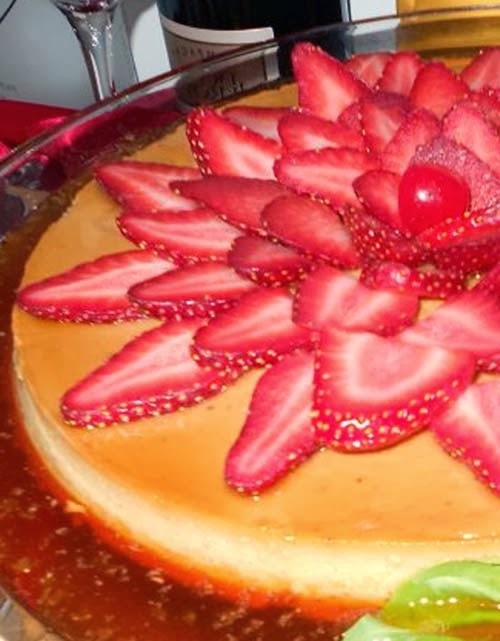 Here's a treat - a coffee flan. See what I did there? Actually, this flan recipe is adapted from Allrecipes.com. Water in the ingredients has been replaced by an equal amount of coffee. And the flavor is fantastic. 2. In a heavy skillet over medium-low heat, cook and stir sugar until melted and light brown. Carefully pour into a 9-inch round baking dish, tilting the dish to coat the bottom completely. 3. In a medium bowl, beat egg yolks and egg whites. Stir in water, condensed milk, vanilla and salt until smooth. Pour into prepared dish. Line a roasting pan with a damp kitchen towel. Place baking dish on towel, inside roasting pan, and place roasting pan on oven rack. Fill roasting pan with boiling water to reach halfway up the sides of the baking dish. 4. Bake in preheated oven 1 hour, until center is just set (still a bit jiggly). Remove dish to a wire rack to cool for one hour. Then refrigerate several hours or overnight. 5. To unmold, run a knife around the edge of the pan and invert onto a rimmed serving platter.